According to the Occupational Safety and Health Administration (OSHA), musculoskeletal disorders, or MSDs, account for more than one-third of all lost-workday injuries and illnesses. MSDs are injuries caused by repetitive motion, awkward positioning and contact stress, and they are becoming increasingly common in office environments. To counteract the risk of MSDs, keep your employees happy and healthy, and avoid costly healthcare and disability leave expenses, you can train your employees on good office ergonomics. When you hear the word ergonomics, you may think of expensive, gimmicky office equipment. However, ergonomics is a real science, not just a marketing technique. Ergonomics is influenced by physiology, kinesiology, biomechanics and more. OSHA describes it as the science of designing a job to fit a worker, rather than physically forcing the worker’s body to fit a job. Good office ergonomic practices reduce physical stress on an employee’s body and help prevent long-term injuries and disabilities, like chronic neck pain or carpal tunnel syndrome. You should provide all employees with proper ergonomic training, and regularly inspect your office for ergonomic hazards, such as old equipment, poor lighting, and uncomfortable or unsupportive desk chairs. The main goal of ergonomic chairs, keyboards, wrist pads and other equipment is to maintain neutral body positioning while working at a desk. Neutral body positioning keeps your body properly aligned while sitting for long periods of time. To achieve neutral body positioning, your hands, wrists and forearms should be in a straight line, roughly parallel to the floor. You shouldn’t have to bend your wrists to use your keyboard or mouse. Your head should be level, balanced, and facing straight ahead. Your shoulders should be relaxed and your elbows should stay in close to your body. Both feet should be fully supported by the floor or by a footrest. Your back should be straight and supported, and you knees should be about the same height as your hips. VIEW THIS COURSE AND MORE! 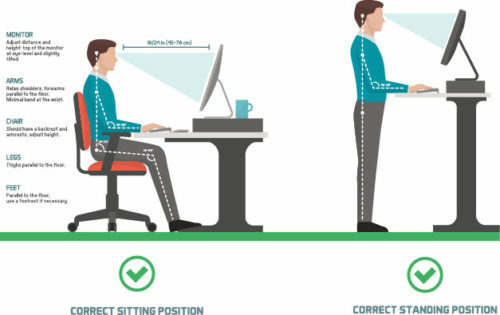 When sitting at your desk, make sure that your chair is adjusted so that the desk is at roughly elbow height. Both feet should be supported by the floor or by a footrest. Ideally, your chair will have good lumbar, or lower back, support. The chair should support your thighs and hips, and they should be roughly parallel to the floor. Your knees should be about the same height as your hips, and your feet should be placed slightly forward. You can use a footrest to raise your legs to hip height, especially if you have to raise your chair up to put the desk at elbow level. If you’d like to recline your chair, try to keep your torso and neck in a straight line and recline between 105 and 120 degrees backward. If you use a standing desk, adjust the desk so that it is at roughly elbow height. Be sure to keep your legs, torso, neck and head in a straight line. Stand with your feet slightly apart. If you’d like, you can rest one foot on a foot rest. Adjust your monitor so that the top third of the screen is at roughly eye height. Consider how your shoes affect your height. If you wear boots or heels that make you taller, you’ll need to adjust your desk to elbow height. You can use stacks of books or special stands to elevate things to wrist height from a normal table. Try to avoid reaching uncomfortable distances or twisting while standing. You should place an ergonomic mat under your feet whenever you are standing for long periods of time to help prevent strain on your feet, knees and hips. 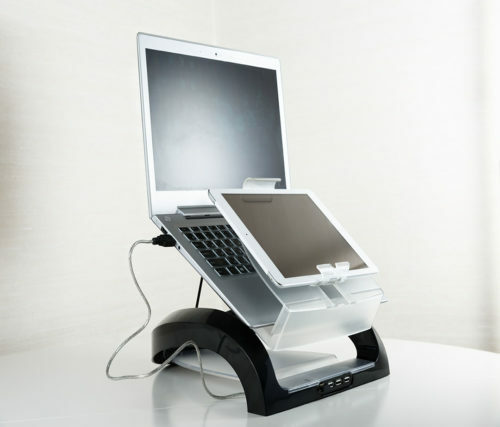 If you use a laptop as your primary work computer, you can place it on a stand that elevates it to eye height and use a separate keyboard and mouse. You can also plug your laptop into an external monitor and use a separate keyboard and mouse. You should try to avoid using laptops for long periods of time, because they cause strain on the wrists and neck. Good ergonomic practices can help prevent life-altering workplace injuries and illnesses. You should evaluate your workplace for ergonomic hazards, and work with your employees to determine what types of ergonomic equipment you should provide. You should provide all employees with ergonomic safety training and routinely ensure that they’re following good ergonomic practices. SafetySkills covers these topics and more in our Office Ergonomics course.